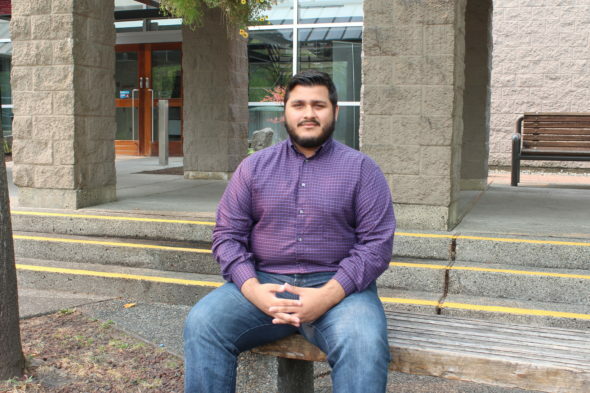 Kwantlen Polytechnic University boasts a diverse student body. It welcomes folks of various nationalities, ethnicities, genders, ideologies, and sexual identities. Representing these groups, however, has always been a challenge for members of the Kwantlen Student Association, which balances the day-to-day duties of student governance with advocating for a sizeable and widely-dispersed student populace. In many ways, the KSA, and the university at large, can be proud of what has been done to make KPU campuses more inclusive and equitable. But as members of the association will themselves attest, there is still much work to be done. (Left to right) KSA VP Student Life David Piraquive and VP Finance & Operations Joseph Thorpe. Thorpe is also the student association’s Queer Representative (Ashley Hyshka). Joseph Thorpe, VP Finance & Operations and Queer Representative for the KSA, describes student life at KPU as “barren.” He points to hectic school schedules, a lack of student resources, and that fact that KPU’s student body is split between four commuter campuses as primary reasons for this. Currently, Thorpe is the only member of the Kwantlen Pride Collective. With the opening of Pride Kwantlen’s space in KPU Surrey’s Birch building, and an influx of new students expected this fall, Thorpe’s goal is to recruit more members at this year’s Welcome Week from Sept. 10 to 13. He also wants to hold events on various LGBTQ+ holidays to help educate students. “When people join university, it’s a time of growth and a time of self-discovery, and if there’s not an active pride collective, or there’s not an active amount of students who understand what you’re going through, it’s harder to navigate your way through university,” he says. Thorpe feels that the best action for a student feeling underrepresented at KPU can take is joining KSA Council. “[Council is] going to be supportive in what you want to do compared to being a random student just trying. You have avenues,” he says. According to Thorpe, all KSA executives are working together to improve student life this year, as opposed to letting the student life executive worry about it on their own. “We have money that we can use towards events and fundraisers and advocacy, so we have the support. All you have to do is join,” says Thorpe. Like Thorpe, Caitlin McCutchen—who serves as the president, vice-president external, and women’s representative for the KSA—is optimistic about the upcoming school year and is hoping to increase engagement from students. McCutchen says that the women’s collective currently doesn’t exist because it has no active members. Last year, she says that it was comprised of “a really good group,” but due to many of these members graduating, the activity of the collective is in limbo. One of McCutchen’s goals for the new year is to reestablish the women’s collective, starting with a consent campaign that will be launched during Welcome Week. Through the campaign, she hopes to raise awareness of both the collective and the women’s center, which will be used to host meetings and events. “I’m only one person. I can’t think of all the ideas and all the events, so I really hope to find a team this coming fall that is really interested in bringing feminist voices and feminist events to campus,” she says. According to McCutchen, several feminism-based events have been planned for the fall. She hopes that these events will help spread the word that the women’s collective will soon be back, fully active, and in need of new members. Sarah Strachan, The KSA’s Indigenous representative and the chairperson of its external affairs committee, believes that engaging with the Kwantlen First Nation and representing Indigenous students at KPU go hand in hand. Despite KPU being named after the Kwantlen First Nation, and residing on its land, Strachan believes that most students don’t know about KPU’s Indigenous history and community. That, and the fact that KPU’s Elder in Residence, Leykeyten, can only be on campus once a week, is hindering Indigenous representation and education, she says. Strachan’s plans for the fall semester include hosting two events per month on different campuses. One event will revolve around arts and crafts, and the second will feature Indigenous speakers, writing, and media. “I am beyond excited for this new year and I hope that, as we reach out to all the campuses, I will finally get to meet our Indigenous population,” she says. 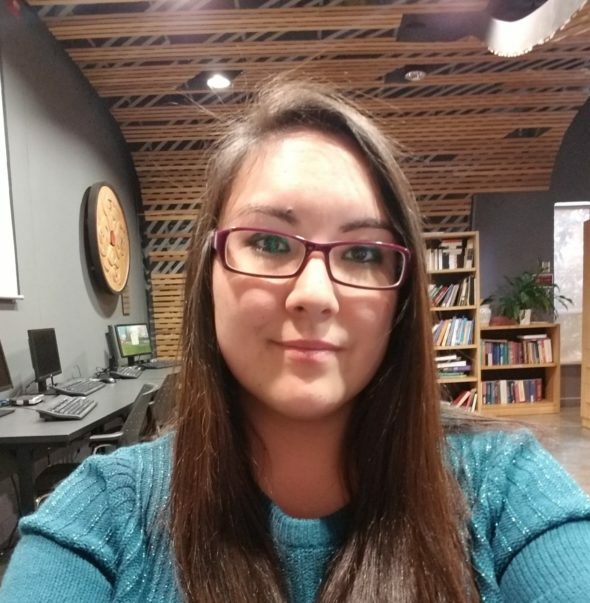 She also believes that, because the university acknowledges that it is on unceded First Nations territory during events and meetings, these same acknowledgments should be made in the classroom to educate students and better represent Indigenous students. Strachan encourages students to personally contact her and inform her of events relating to Indigenous representation that they would like to see at KPU. Richard Macmillan of KPU’s “Let’s Be Compassionate” club (Ashley Hyshka). 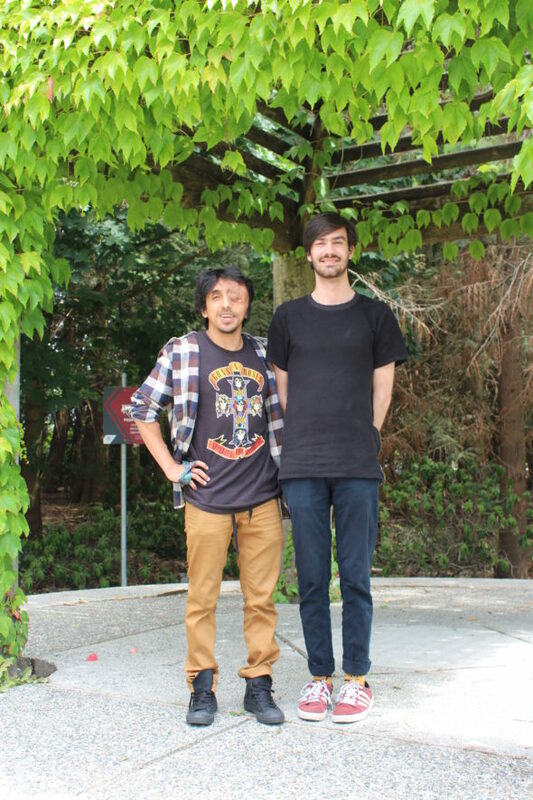 Richard Macmillan, a fourth-year policy studies and sustainability student, operates the Let’s Be Compassionate club, which advocates for animal rights at KPU. Macmillan says that there’s a sizeable vegetarian and vegan population at KPU, particularly on the Surrey campus. 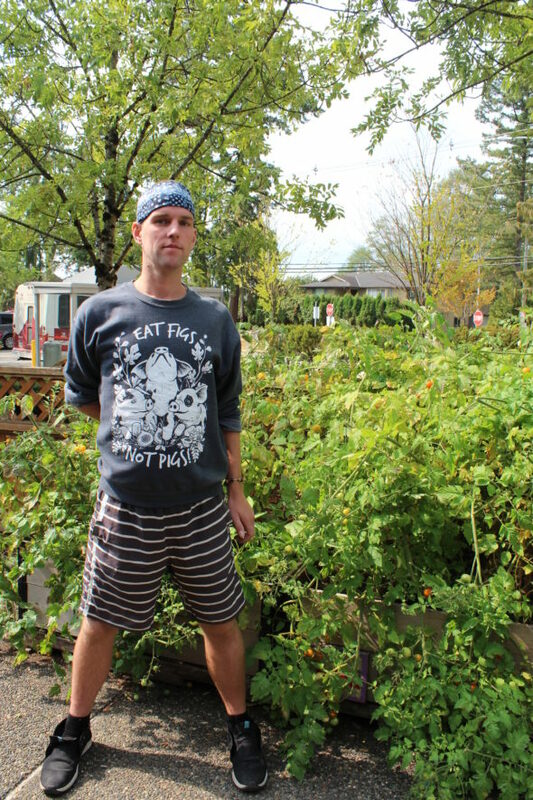 He describes becoming vegetarian as “an amazing step,” but believes that switching to a vegan lifestyle is most beneficial for supporting animal rights, environmentalism, and one’s health. “Our main focus is drawing attention to what happens to farm animals every day in slaughterhouses [and] in modern farming—so giving them a voice,” he says. Many vegan and vegetarian students are hindered by the food options provided to them on campus. At KPU Surrey, for example, their choices are limited mainly to what’s available at the Grassroots cafe. While Macmillan is appreciative of the support that Sodexo has offered him—including the introduction of “Meatless Mondays”—he feels that it’s still not enough. According to him, progress is restricted on this front because of the limited number of food vendors Sodexo utilizes. For instance, he notes that the Sodexo-owned Tim Horton’s on the Surrey campus only began stocking soy milk last semester. “I would give Grassroots, like, a B+ and I would give Sodexo probably, like, a D,” he says. Still, Macmillan commends KPU for being supportive of his initiatives and accommodating his events. Let’s Be Compassionate is planning several fall events, including a Veg Expo during Thrive Week in late October. The expo will feature an endurance athlete speaker, an undercover farm investigator, and cooking and yoga demonstrations. Macmillan says that it’s easy to get new students to sign up for the club, but challenging to keep them as active members. His focus for the upcoming semester will be on student outreach, film screenings, explaining the differences between veganism and vegetarianism, and handing out vegan ice cream. Munir Dossa, KSA Students of Colour Representative (Ashley Hyshka). Students of colour, particularly international students, represent a large portion of KPU’s population. Munir Dossa, KSA Students of Colour Representative, says that the university does “a fairly good job of representing students of colour on campus,” but that there is still room for improvement. Students of colour and international students often struggle to balance how much to adhere to their own culture with how much to embrace Canadian culture. With the influx of international students to KPU in recent years, Dossa says he witnesses this struggle often. Dossa himself was born in Canada, but his parents hail from Pakistan. He says that he understands the challenges that his fellow students endure. To this end, he appreciates the KPU Bhangra Club, which he views as a testament to embracing one’s own culture and sharing it with other students who may be unfamiliar with it. Dossa says that one of the key elements of representing students of colour is having a diverse KSA Council. He would like to see the creation of a designated space on campus where students can comfortably engage with KSA councillors. He would also like to see the KSA host events designed to inform students of the student association’s purpose. Personally, he wants to hold bi-weekly screenings of films and television shows featuring people of colour in lead roles. Dossa says that past events like this were well-attended and effective for creating a welcoming and productive atmosphere on campus.